A circuit breaker is an automatically operated electrical switch designed to protect an electrical circuit from damage caused by excess current, typically resulting from an overload or short circuit. Its basic function is to interrupt current flow after a fault is detected. In small mains and low voltage circuit breakers, fault current is usually done within the device itself. Typically, the heating or magnetic effects of electric current are employed. Stotz’s invention (patented by Brown, Boveri & Cie in 1924) was the forerunner of the modern thermal-magnetic breaker commonly used in household load centers to this day. Thermal magnetic circuit breakers, which are the type found in most distribution boards, incorporate both techniques with the electromagnet responding instantaneously to large surges in current (short circuits) and the bimetallic strip responding to less extreme but longer-term over-current conditions. Once a fault is detected, the circuit breaker contacts must open to interrupt the circuit. When a high current or voltage is interrupted, an arc is generated, and this situation must be handled properly. Low-voltage miniature circuit breakers (MCB) use air alone to extinguish the arc. These circuit breakers contain so-called arc chutes, a stack of mutually insulated parallel metal plates which divide and cool the arc. Circuit breakers are usually able to terminate all current very quickly: typically the arc is extinguished between 30 ms and 150 ms after the mechanism has been tripped. Circuit breakers are rated both by the normal current that they are expected to carry, and the maximum short-circuit current that they can safely interrupt. The DIN rail-mounted thermal-magnetic miniature circuit breaker is the most common style in modern domestic consumer units and commercial electrical distribution boards throughout Europe. This type of circuit breakers are labeled with the rated current in amperes, preceded by a letter, B, C, or D, which indicates the instantaneous tripping current — that is, the minimum value of current that causes the circuit breaker to trip without intentional time delay. When supplying a branch circuit with more than one live conductor, each live conductor must be protected by a breaker pole in “common trip” breaker. Typical domestic panel circuit breakers are rated to interrupt 10 kA (10000 A) short-circuit current. International Standards, IEC 60898-1 and European Standard EN 60898-1, define the rated current In of a circuit breaker for low voltage distribution applications as the maximum current that the breaker is designed to carry continuously (at an ambient air temperature of 30 °C). The commonly available preferred values for the rated current are 6 A, 10 A, 13 A, 16 A, 20 A, 25 A, 32 A, 40 A, 50 A, 63 A, 80 A, 100 A,and 125 A. One thing that needs to be sometimes taken into consideration also the power loss and heating generated on the circuit breaker. When fully loaded, the circuit breaker can generate several watts of power loss. For example Schneider document on calculating heat generated by molded case circuit breaker mentions that a circuit breaker manufactured by them generates/loses 7.9 Watts per pole. 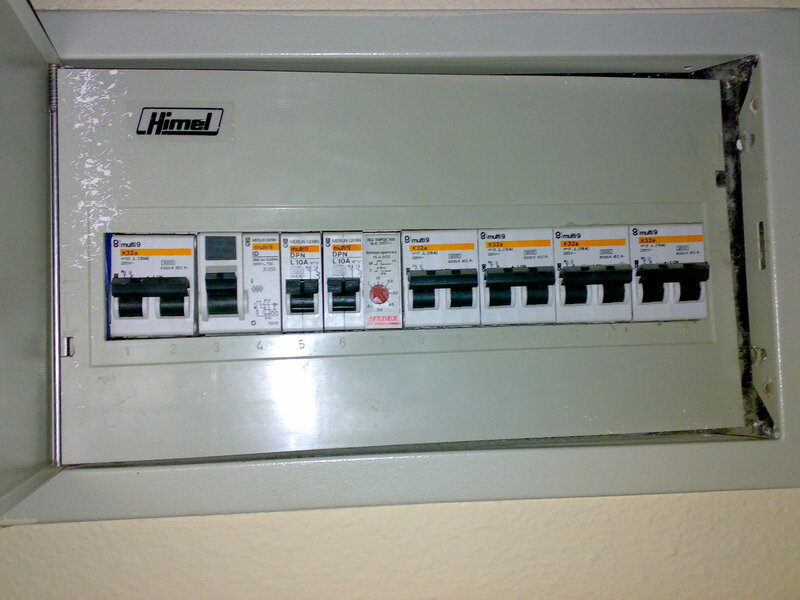 This causes energy loss, heating on the panel and some voltage loss. The voltage loss is not typically issue on normal mains voltages, but when circuit breakers are used in low voltage applications, this needs to be taken into account (lower the current rating, typically more internal resistance and voltage loss at full load). In response to the question “What’s the difference between standards IEC 60898-1 and IEC 60947-2?”, I’m tending to answer with another question: What do they have in common? They are both standards that specify requirements for low-voltage circuit breakers. Is there more in common? Let’s look into. IEC 60947-2, which I introduced at length in the first of these blog posts, governs CBs for industrial applications. They protect electrical power distribution of up to 1000 volts a.c. and 1500 volts d.c. with whole spectrum of rated current from 0,5 to 6300A. Utilities and manufacturing facilities use them: air circuit breakers (ACBs), molded case circuit breakers (MCCBs) and miniature circuit breakers (MCBs). As for IEC 60898-1, it relates to the a.c. low-voltage circuit breakers – MCBs – we find in our homes, schools, shops, and offices electrical distribution switchboards. The standard states that the top rated current is 125A, while the lowest is 6A and maximum value of rated short-circuit capacity (Icn) is 25kA. Many more differences and IEC 60898-1 and IEC 60947-2? Yes. The rated voltage currently required in industrial-use CBs is 440, 690 volts or higher. Compare those numbers to the 400V upper limit between phases for residential MCBs. Users confuse – particularly “prescribers”, e.g. those people who draw up specifications in invitations to tender. Procurement managers in utilities, too, can get things wrong. As to how they mix up the standards, I can’t say. But happen it does. Can IEC 60898-1 be used instead of IEC 60947-2? No. Consequences can be dire if residential CBs are used instead of industrial ones. An MCB designed for indoor, pollution-free conditions would be woefully inadequate for harsh, outdoor applications that require pollution degree 3. Typically IEC 60898-1 certified CBs meet minimally required performance to proof proper protection of household installations: Pollution degree 2, impulse voltage 4kV, isolation voltage is the same as nominal voltage 400V. Where should be used IEC 60898-1 certified CBs? The most suitable solution for use are MCBs certified with both standards as their performance meets requirements of use for residential installations and high enough for use in industry and infrastructure applications. I can say is that mix-ups of standards happen. are specified in IEC 60364-4-43.
tripping curve for overload protection. Test set up with an overhead line to a 20 Amp MCB protected piece of 1.5 mm² TPS cable. Later the MCB was bypassed to see what happened. The 1.5mm² TPS overheated rapidly and burnt out. A bolted short was made on the OH line. The overhead line 2.5mm² overheated rapidly and the pvc insulation melted as well as the line sagged. A test set up and visualize what happens when a rewireable fuse, MCB (miniature circuit breaker) or no fuse is fitted in an electrical circuit. Wire of 2.5mm² is used which is normally rated for 16 or 20 Amp power circuits in 240 Volts systems, depending how long the runs are. First test after the intro is a rewireable 15 Amp fuse which pops. Second test after the intro is with a 16 and a 32 Amp MCB which trip almost immediately. Then the protective device is bypassed and a 300 Ampere current is flowing making the 2.5 mm² wire acting as a fuse itself. How the Regs are changing the Fuse Box we fit in your house. Different types of circuit breaker, tripping current and considerations when using them. This video is only a rough display of what’s involved when replacing or upgrading a consumer unit. It doesn’t go into too much depth or show the final labelling, fire sealing with compound or testing. Finding the correct torque setting on a Crabtree Starbreaker MCB and using a Wiha electricians torque screwdriver to correctly connect conductors at the required Nm torque setting. Video includes a full demonstration of setting up the torque screwdriver correctly and using it. How often do you calibrate your torque screwdrivers? How do you know it’s set right. What if the mcb is old. Torque screwdrivers are fine, if you’re working and on new equipment even then it doesn’t seem tight enough sometimes. Are you experiencing electrical problems? Would you like to learn how you can inspect your electrical panel to identify common problems as well as how you can correct them? If so, then this video is for you. I also explain how GFCI’s/Surge Arresters work, and show you useful test equipment. DISCLAIMER: If you’re not comfortable working with 120V/240VAC electrical wiring, or unaware of the dangers of working with 120V/240V wiring, then DO NOT attempt to work on your unit! Safety first! AC Mains Power has the potential to KILL or injure you. A circuit breaker is used for switching mechanism and protection of the system. Other associated devises and components are also used for this purpose associated with circuit breakers like fuses, relays, switches etc. Circuit breakers are widely used in industries as well as power system for controlling and protection of different parts of the circuit like switch gears, Transformers, Motors, Generators/Alternator etc., which leads the system stable and reliable. A look inside a British home electrical panel. Note that in this video the panel is new and has no external circuits connected yet. When wired in and active there is a lot of exposed live metalwork that poses a shock risk. Changing a consumer unit is not a simple DIY task due to the presence of a high current supply that poses a shock and burn hazard if touched or bridged. A typical home will get a single phase and neutral with the three phases spread amongst homes in a street, while a factory or commercial premises will usually get all three phases.